April | 2012 | Crappy Kitchen - Good Dinners! Easter is a big deal in the United States but for different reasons than in Italy. I know this is a blanket statement, but after living in the United States for many years, combined with being born and raised in Ireland, and finally, being a witness to the Easter procession this past Good Friday in Cortona Italy, I have a definite opinion on the matter. The reason I know Easter is approaching in the United States is I begin to see front lawns and yards decorated with everything from trees and bushes strung with painted plastic eggs, to giant blowup Easter bunnies tied down to lawns (not discounting wheelbarrows full of eggs, inflatable yellow chicks, and giant Easter baskets sporting colorful ribbons). North America takes on every holiday, religious or not, with a tacky kind of gusto that you either love, or hate. I came from a country where the only visible sign of a Holiday was during the Christmas season when sometimes you caught a glimpse of the neighbors christmas tree lights through a window. There was no question that anyone would decorate the outside of their house with bunnies at Easter time (in fact, I had never heard of the easter bunny! ), giant plastic snowmen at Christmastime, big red hearts on St. Valentine’s day, shamrocks and leprechauns on st Patrick’s day, or fake turkeys and pumpkins during Halloween. I’m not saying that all of this hype is completely abhorred by me. It is just something I was not used to, and still find it a little odd, although it does make for interesting driving with plenty of stuff to distract your eyes from the road. My point is that the glitz and the commercial hype that surrounds a religious holiday suffocates the actual reason for the observation in the first place. The first sign that Easter was on it’s way in Ireland was when my teacher would ask what selfless act we were going to do during lent. From that day I knew it was exactly forty days to Easter Sunday. The purpose of Lent is to prepare you for the death and resurrection of Jesus Christ, through acts of prayer, penance and self-denial. Good Friday was a day of fasting, with fish for dinner, and Easter Sunday was marked by a colorful mass and a great feast afterwards, usually involving a leg of spring lamb. It was not without it’s commercial side, because I also looked forward to being given (and devouring) a giant hollow chocolate egg after dinner. These brightly wrapped eggs were displayed in shop windows for the duration of lent, which was a painful temptation if you happen to deprive yourself of chocolate for the whole forty days as an act of penance and self-denial! 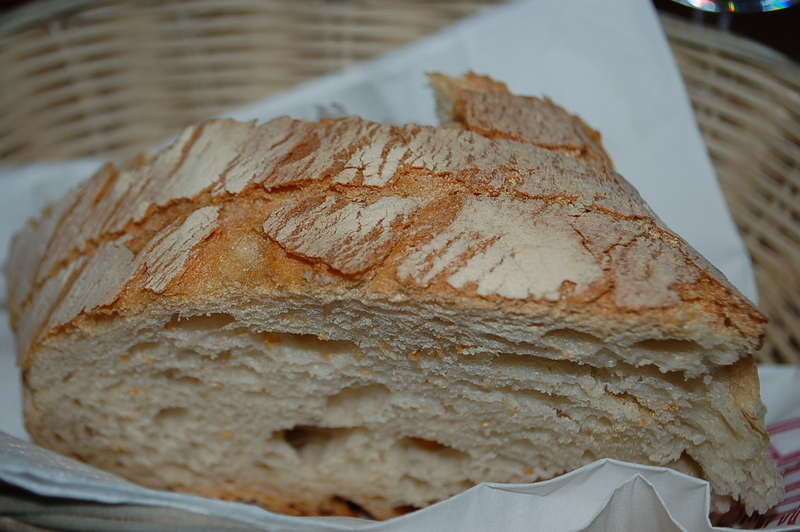 Here in Cortona the first sign of Easter was at the bakeries in the form of a bread made only during lent called Spoleto. This Umbrian spelt bread is considered a humble enough breakfast for devout Easter observers, which is a little deceiving as it is more of a treat than a punishment. 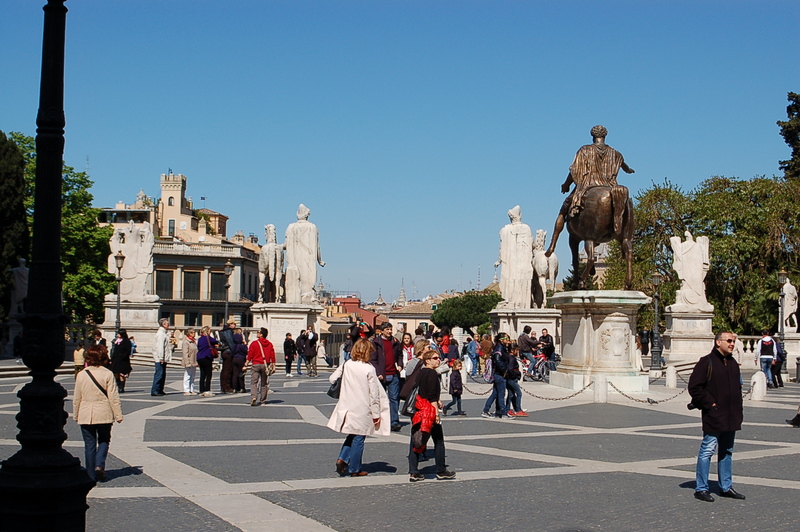 The culminating event in Italy is the Good Friday procession where massive statues of Jesus Christ are carried through town to the steps of the Commune Building in the main piazza. 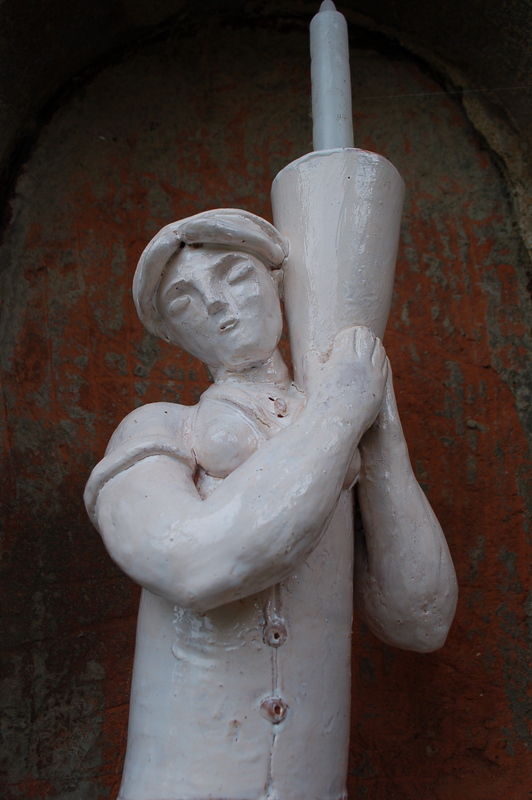 These statues represent Jesus on the day he was crucified, and the stations of the cross are reenacted. A statue of the crucified Jesus is laid on a bed in front of the steps (while also being reunited with Mary, his mother), and prayers are said by the officiating priests and cardinals, before the body of Jesus is removed in another solemn procession to his resting place, before rising on Easter Sunday. 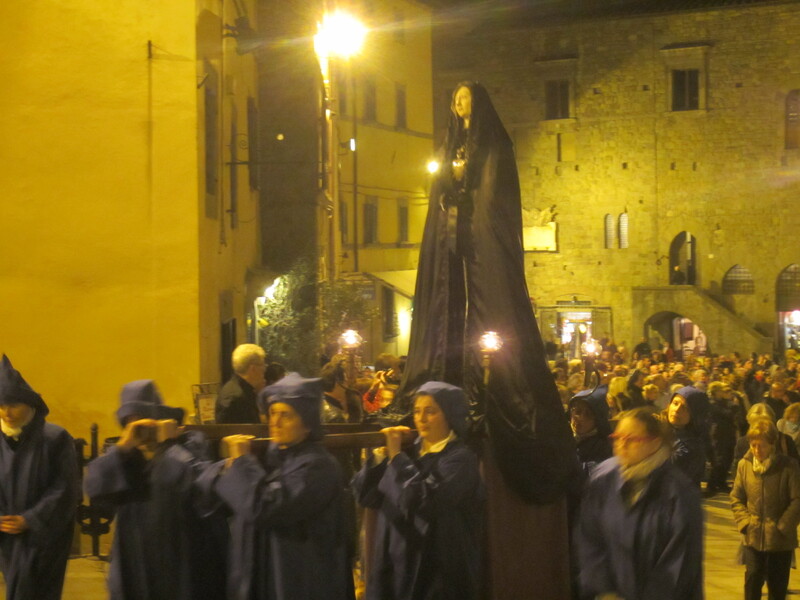 The whole community of Cortona either participated in the procession or was a witness in the piazza. It felt serious and sad, and whether I admit to being a good catholic or not, I was moved by the devotion and respect displayed by the entire country who were having processions like this one at the very same time. 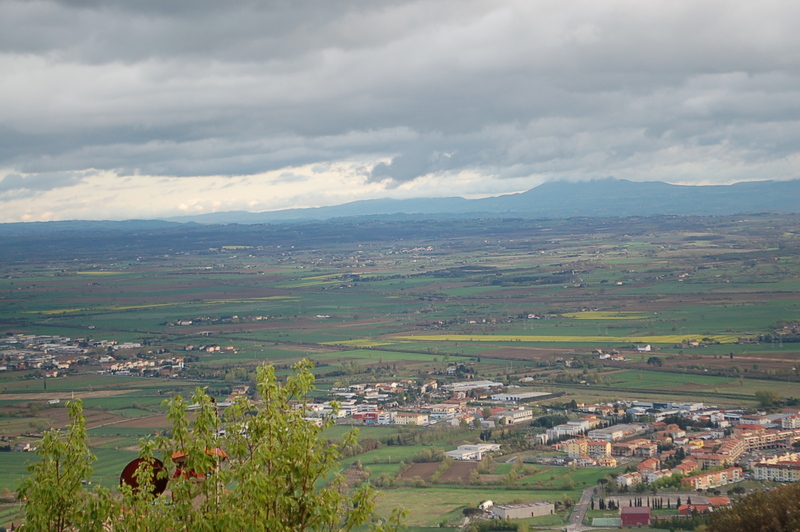 The American students who had been studying abroad in Cortona for the past three months were also thinking about Easter, and, whether catholic or not, were sure to have been missing some sort of Easter celebration back home. From living there I know that many families have a big Easter egg hunt where eggs are hidden (egg could be anything from a real painted egg, to a plastic egg with a prize inside) and found. 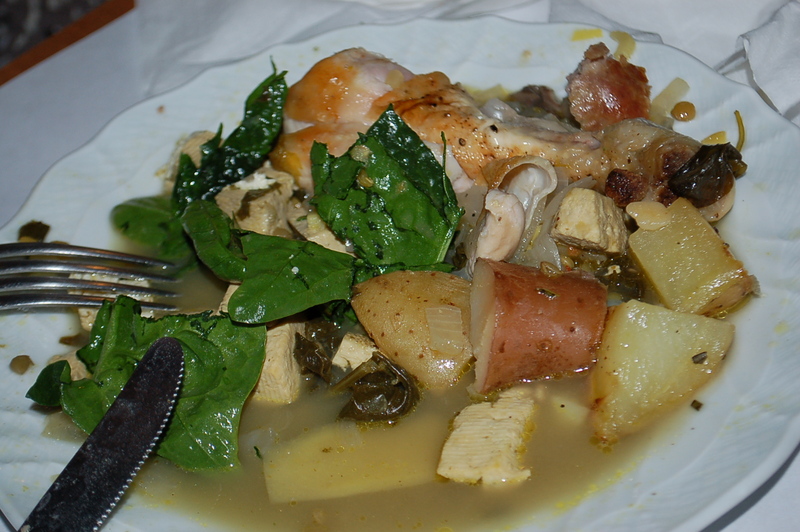 This is followed by a big Easter dinner, which varies from culture to culture. So, there was something that these students were probably thinking about, perhaps making them homesick and a little sad, missing their families more pointedly. I had the idea that I could cook them an Easter dinner in their dining room, and have them all eat together as this new family. When I made the suggestion the response was an overwhelming “yes please!” and so I began to plan it out. We had a meeting to collect names, money for food, and to discuss the menu. I told them that they could help in certain important ways (set the table, wash the lettuce, show up! 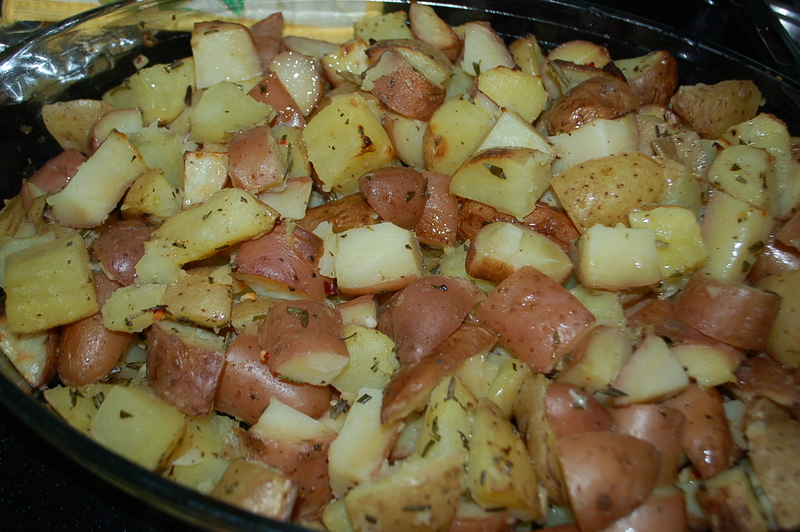 ), but that I wanted to cook for them, just like their mother would have done. For this project, I wanted to treat them like my children and the task was to feed them, and hopefully make them feel like it was a special day, and they were being taken care of in a more maternal way. The worst part of the whole event was going to the town in the valley (Camucia) to buy the food from the giant supermarket there. I had become so use to shopping on a very local level that being in this place with aisles and aisles of food made me want to cancel the whole thing. I spent the most gruelling hour of my life since arriving here, pushing a giant trolley of food from one department to the next under the glare of hideous lighting, while dodging other tormented shoppers. I knew for absolute sure that cooking for over 20 people would be a breeze after that nightmare. On sunday morning I went to the school to see what I could snag from their kitchen by way of pots and pans. My rental apartment was adequate enough but had nothing much when it came to baking trays and containers that could hold large vats of food. I decided to borrow four or so big oven proof tray and planned to cook in steady batches. 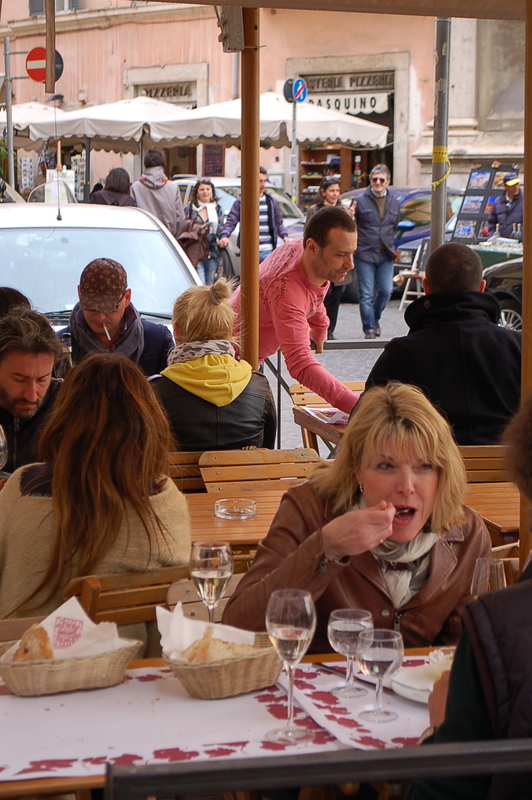 When it comes to figuring our food, quantities and timing, I will admit to being experienced. I cooked for a solid seven hours and was ready exactly when a group of the students rang my doorbell to carry everything up the steep hill to the school’s Breakfast Room. After several trips the food was safely installed in their modest kitchen area. It was a challenge to keep everything warm, but I managed. The thing that took any stress that I might be feeling away was the atmosphere in room. All the students were milling about doing everything from making beautiful flower arrangements for the long clinical tables, to sticking bunny ears made out of white napkins on the handles of every fork. Another reason I smiled is that all of them dressed for the occasion. There was a parade of spring dresses, high heels, fancy scarves and sophisticated hairdos. I was delighted that they were genuinely excited, and not just happy to have a convenient meal. Lettuce was washed, cheese was sliced and arranged on platters, and within an hour of my arriving everyone was ready to sit for Easter dinner. 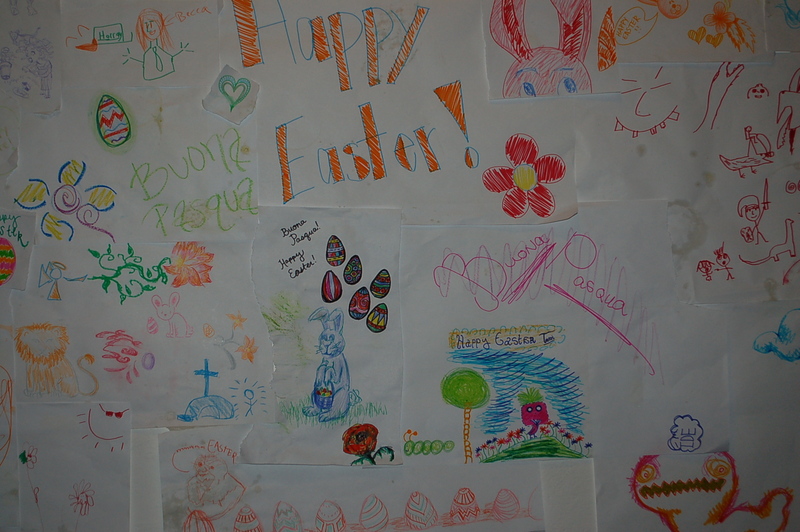 Each place mat was a piece of drawing paper, and each student decorated their mat with all sorts of Easter-themed doodles. When everyone was served I sat with them and experienced my moment of belonging to a group that had knit itself together into a family of sorts. 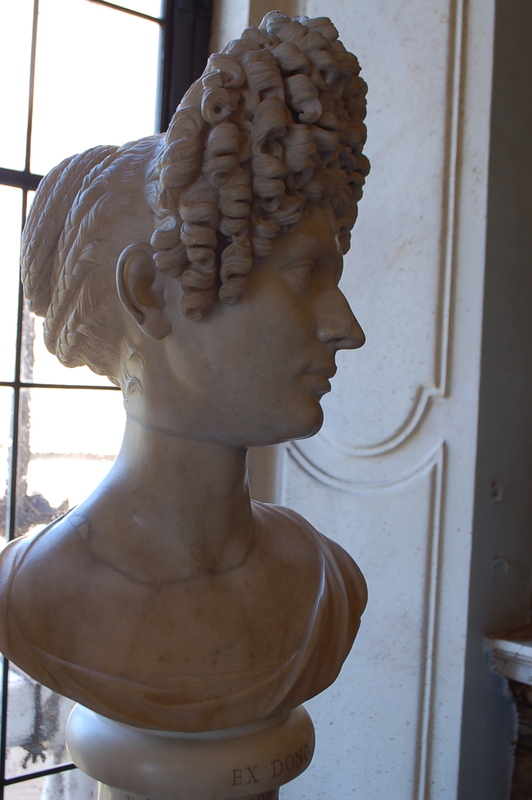 I thought about the day I had met all these strange faces in Rome and felt daunted by the task of trying to get to know their names, forget forming any sort of connection beyond that. 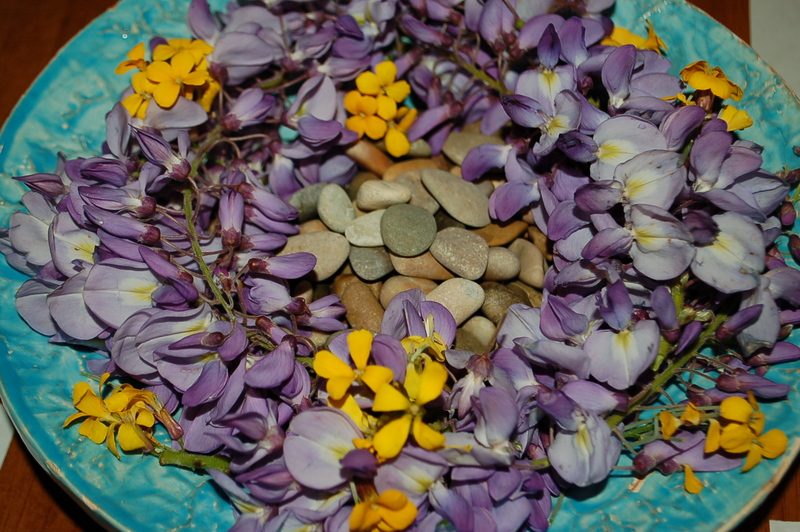 I was now sitting in the Breakfast Room on Easter Sunday with each of their names firmly in my mind, and also aware that despite myself, I had formed enough of a connection I was compelled to feed them like I do my own children, to make sure they were happy on this Holiday away from home. 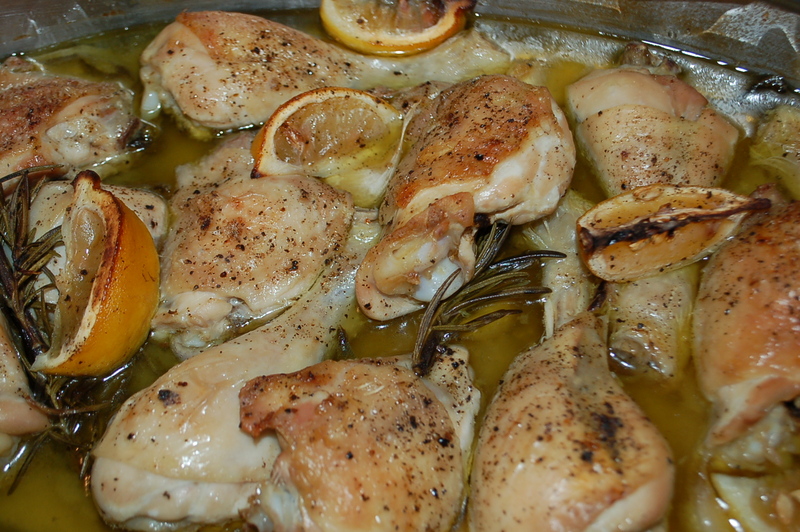 I will remember this Easter Sunday, not alone because I was here in Cortona, but because I got a chance to cook for a gracious group of college students, who found they were missing Easter more than they had realized. 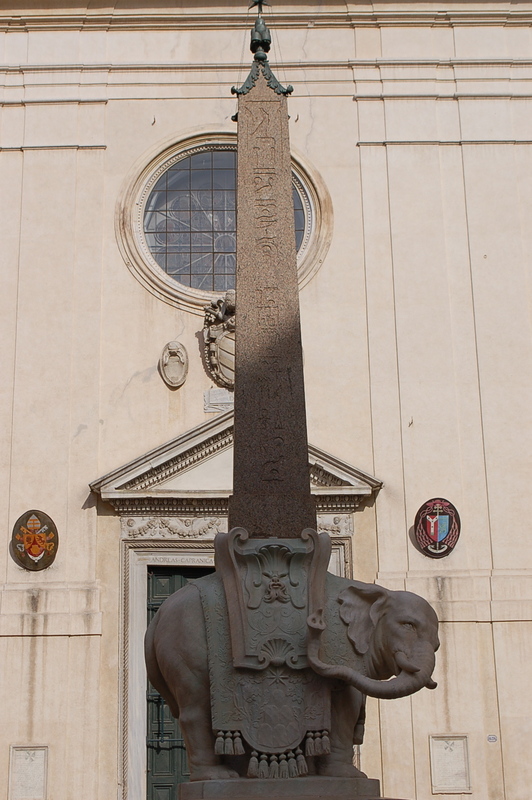 I liked to think of what I was getting myself into by going to Rome this past Easter Monday in a poetic way. 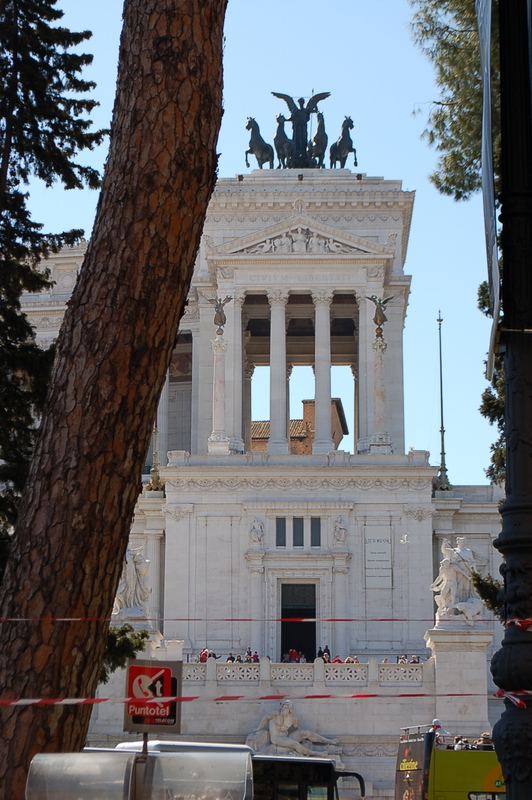 What I mean is, I couldn’t help thinking about the crowds milling on the streets between the enormously spectacular buildings that define Rome for me, as a scene for Milton’s Paradise Lost (book 1). This 17th century poet described the buildings of the “high capitol of Satan and his peers” essentially, the seat of hell, and coined it Pandemonium, which roughly translates as “All-Demon Place” He then goes into truly beautiful detail of what Pandemonium looks like, with “ever-burning sulphur unconsumed” and so crowded it was, “Thick swarm’d, both on the ground and in the air, Brusht with the hiss of russling wings” It is juicy stuff, and the idea of Rome having a little of that flavor on Easter Monday was frightening and enticing at the same time. 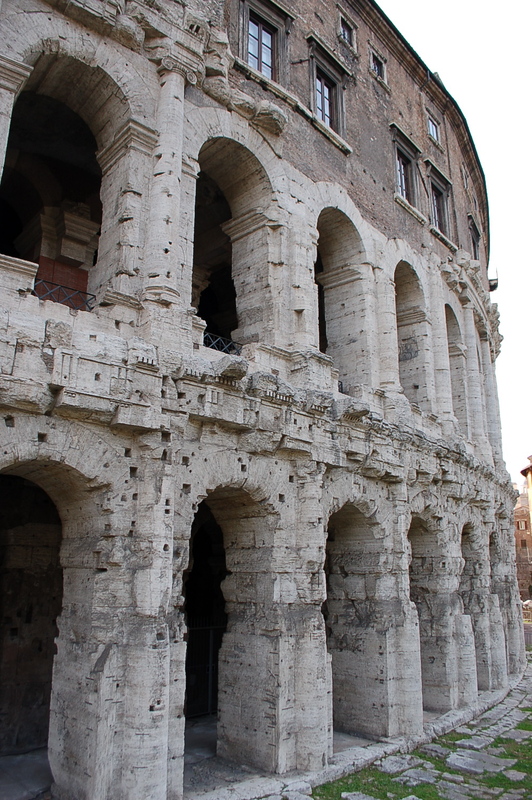 Rome is the perfect setting for a place like Pandemonium. 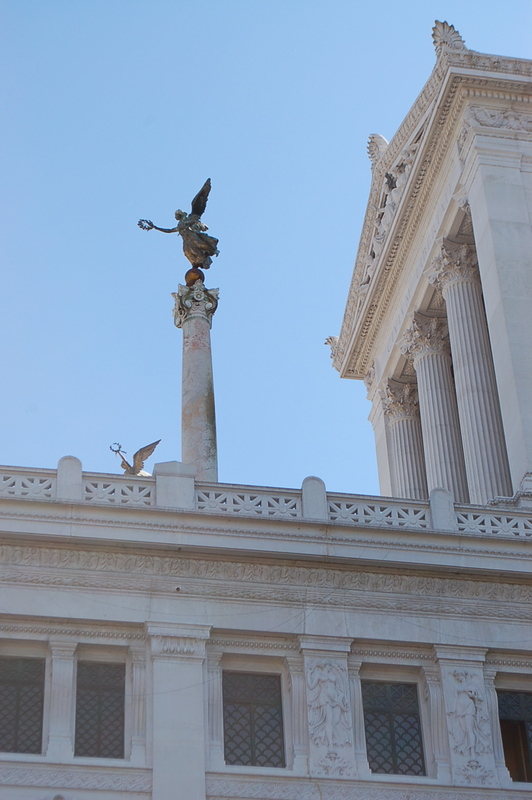 The sheer size and quantity of buildings, public statues and monuments, create a powerful backdrop for it’s seething inhabitants. I could just imagine the throngs of people who would be visiting for the holiday weekend, and decided it might be okay to get swept up in the chaos (another word Milton used to describe the place where God hurled Satan; into a kind of nothingness) of Rome, and not let the disciples of hell bother us! 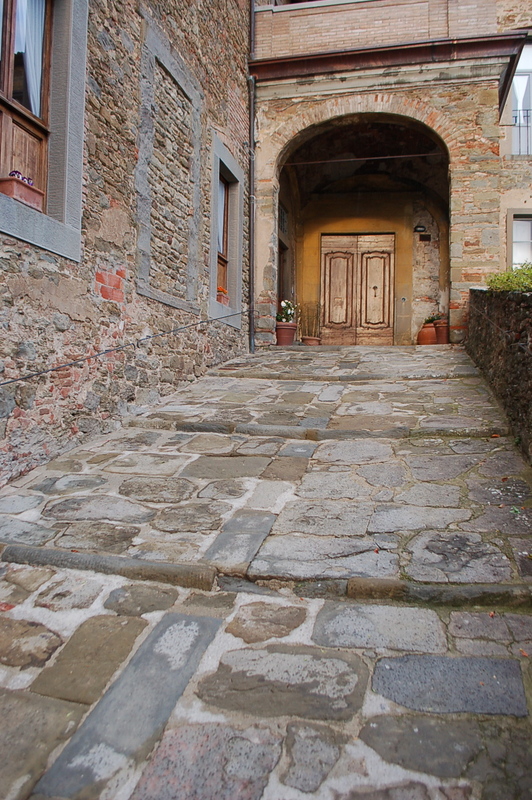 I met my friend to have coffee before getting on the bus that would take us down the hill from Cortona to the train station. We stopped at a cafe closest to the bus stop, a place I had been passing for months but had never ventured inside. The man who served us our much-needed shots of caffeine was a delightful character, and chatted away (mainly to Mario, as speaking Italian is not my strong suit, yet) on how learning english verbs was so difficult, and how it is so much easier for him to understand french! He shook our hands as we left and I marvelled yet again at how everybody who works in the service industry in Italy is genuinely friendly and helpful. This opinion was very much validated when we discovered that buses were not running on Easter Monday, and Mario went back to the cafe to ask our amiable barkeep if he knew of another way down the mountain. He said it was too late to call a taxi, and so we left wondering what to do next. 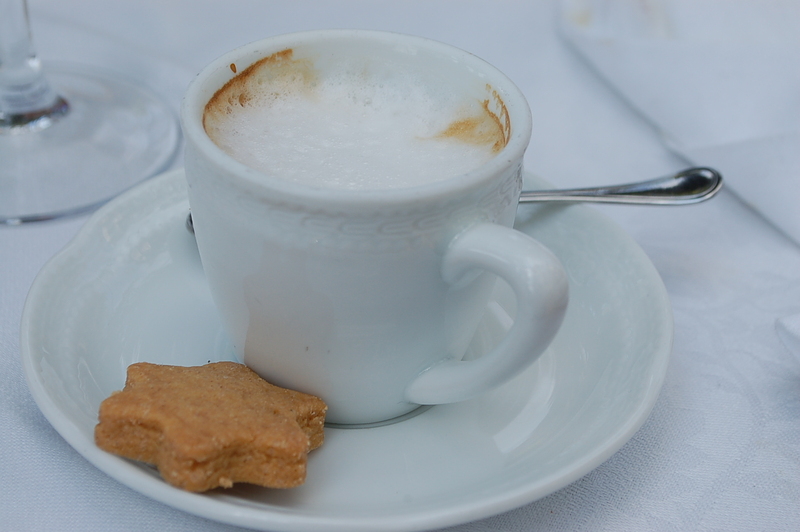 As we stood on the street we heard the slam of the cafe door, a jingle of keys following by Guglielmo (our new friend) running by us, telling us to wait and he would be back in a minute. Back he sped in his new powder blue Fiat Cinquecento, and beckoned us to jump in. He took us to the train station in what seemed like 3 minutes, exactly 1 minute before our train departed. Guglielmo now has two customers for life! On our way to lunch we swung by the Capitoline Museum as I had some specific things I wanted to see (or rather, was instructed to see by my enthusiastic art historian friends), not least among them two Caravaggio paintings. Mario was determined that we eat at this place; Cul De Sac. He told me that their big boast is that there is no kitchen. This was hard to believe as we stood in line watching frantic (but cool of course, this is Italy) hot pasta dishes, and succulent meat dishes being served to the diners who choose to eat outside. Speaking of which, I never eat outside when given the choice. The only time I will do this is if the view is breathtaking, or I am in a very specific mood (don’t ask!). I go to restaurants for two things; the food (of course), and to melt into a room full of strangers, allowing their energy in, while the kitchen bustle stimulates all of my senses. This is powerful stuff, and if you eat outside you miss all of this magic that is going on just for your entertainment. Cul De Sac had all the things I enjoy about eating out. I love crowded restaurants, and this one was packed to the gills with all sorts of interesting looking people. 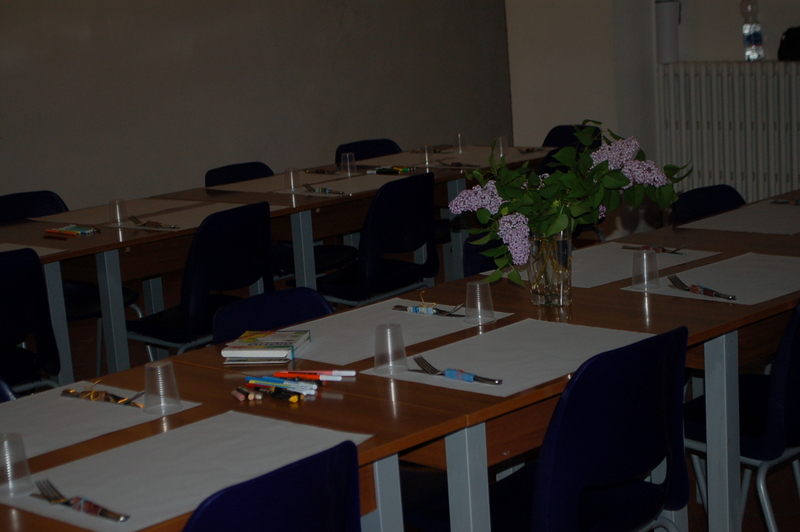 The room was like an alleyway, with tables on each side. 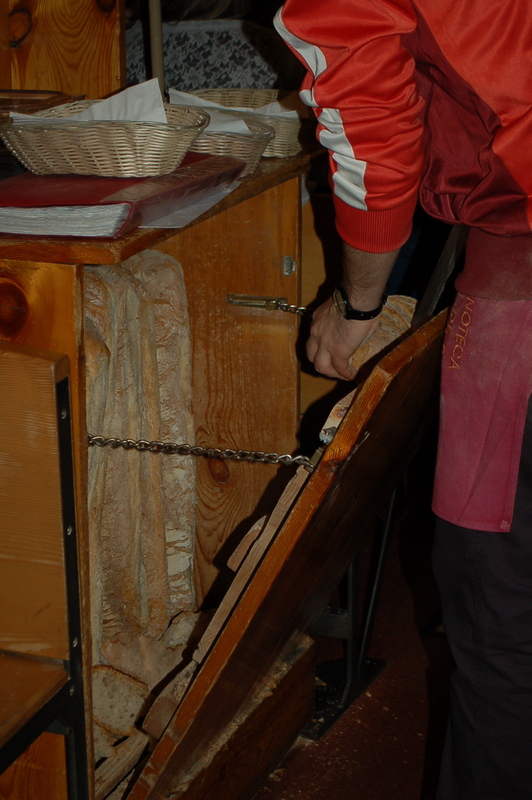 This narrow path was the only way in or out, and was being heavily trod by a highly efficient wait staff. The host was the most charming of gentlemen, made sure we got seated as soon as possible, and then ran around doing whatever else needed to be done. Bravo Marco! 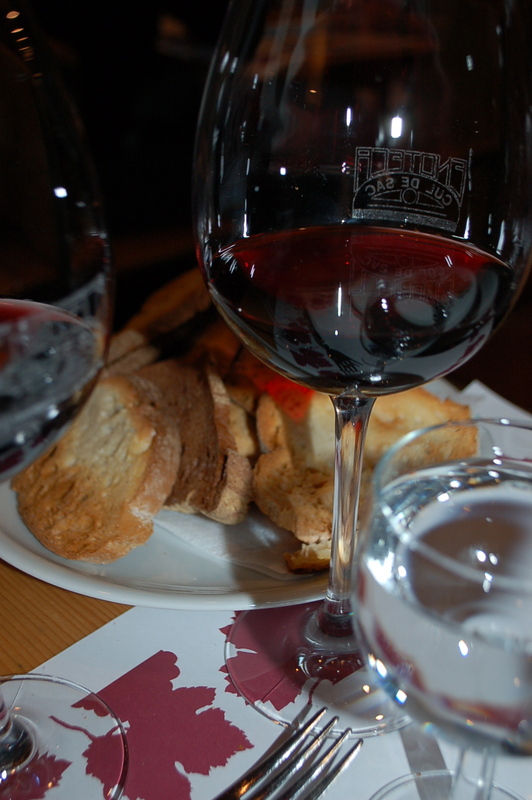 our packed table with a lovely wine from Piedmont region of Italy. I was ultra-curious about the kitchen situation. 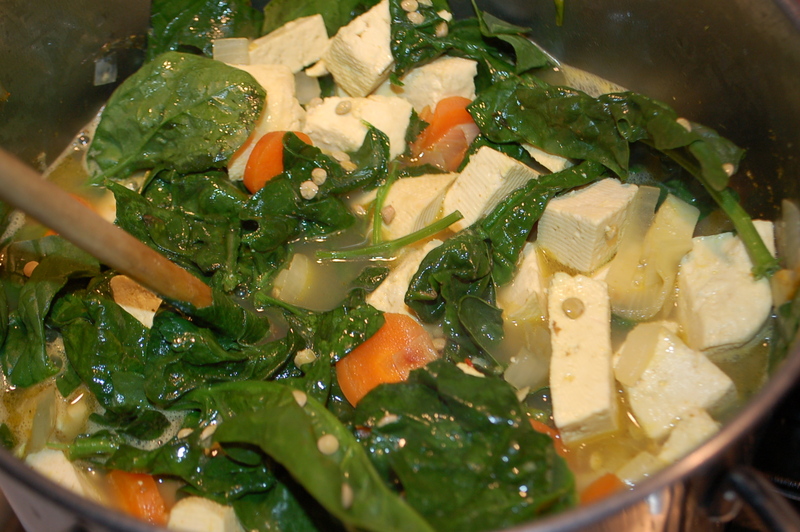 I cook, and therefore knew for sure that having a place to cook is essential. Marco gave me permission to walk around with my camera, and so I decided to take a closer look at the preparation area. I think when they say they have no kitchen that is a bit of a technicality. There was a very narrow galley area where food was being prepared, but it certainly was not reflective of the amazing food that seemed to appear out of nowhere. This whole place was all about how to maximize every inch of precious real estate. Bread was sliced in a cupboard that opened up on the aisle (and closed when not in use). It was truly genius and I couldn’t stop watching when they swiftly opened the door, cut bread at a frantic pace, dumped it into a basket and slammed the whole thing shut as they walked away! Another very clever use of space was how they rigged a place to put coats so as not to jam up the already crowed and tight dining space. 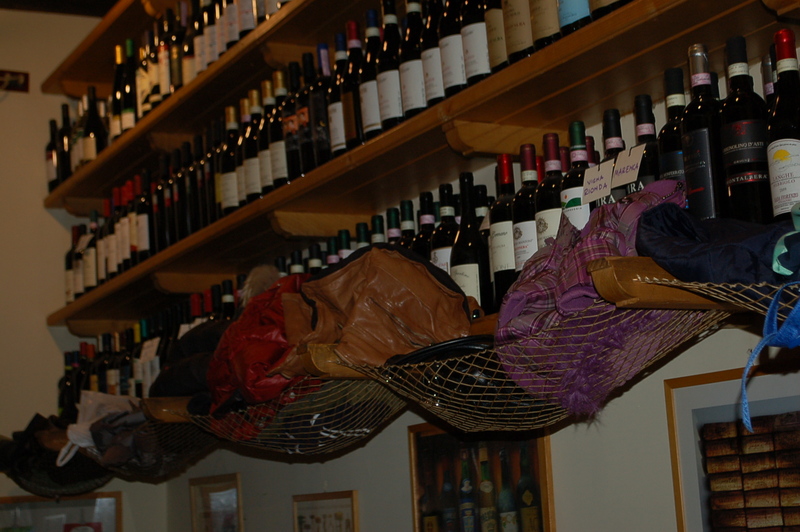 Above our heads, and just below the rows and rows of wine bottles was a net where you could plop your coat or bag. This was another argument for eating inside rather than out. I would have missed all of these cool features. I haven’t even mentioned how great the food was. 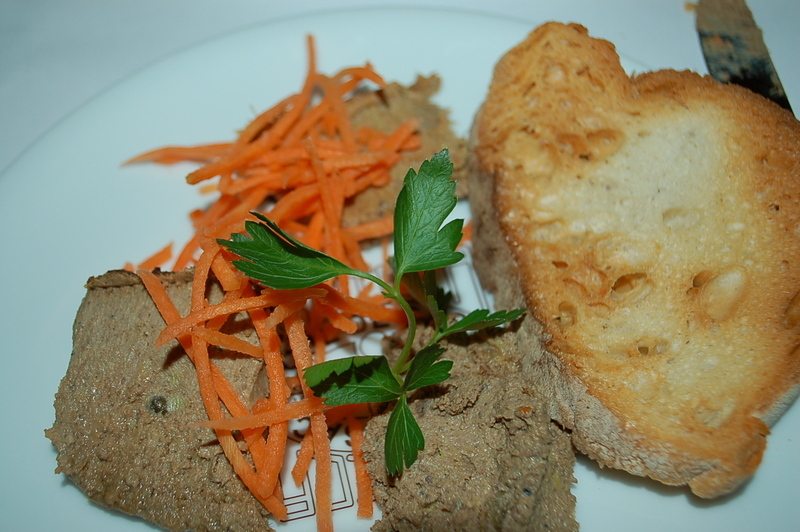 We started with three different types of pate, and it was a great way to start our lunch. 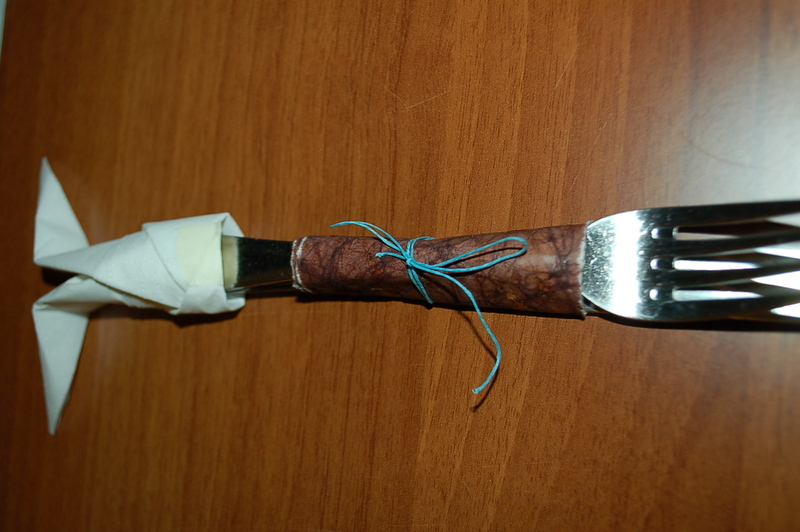 It helped us ease into the moment and really enjoy the action of eating. I hadn’t had pate in years and the strong flavors were exactly what my taste buds wanted, not to mention how great it was with the red wine. 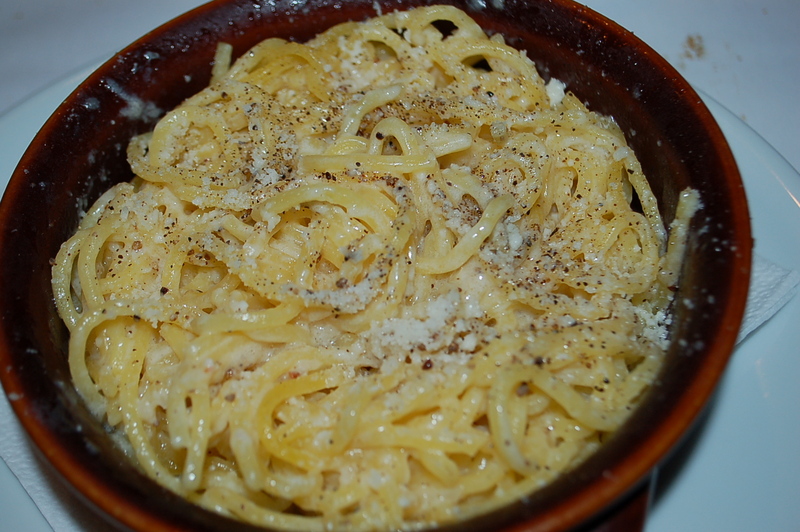 We followed the pate with bowls of spaghetti laced heavily with black pepper. 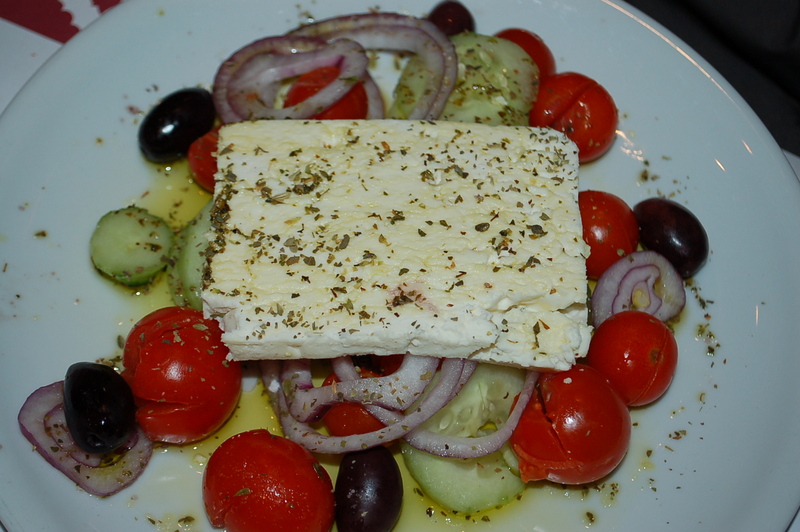 Next came our greek salads which were fresh and zesty with a lovely crumbly feta crowing the lot. I was so full already, but I did manage to eat more than half of it before deciding that it was best not to risk exploding in public. Two hours later we asked our waiter for the bill, and it was brought to us by the lovely Marco who had given us special treatment ever since I kindly asked if I could take pictures. 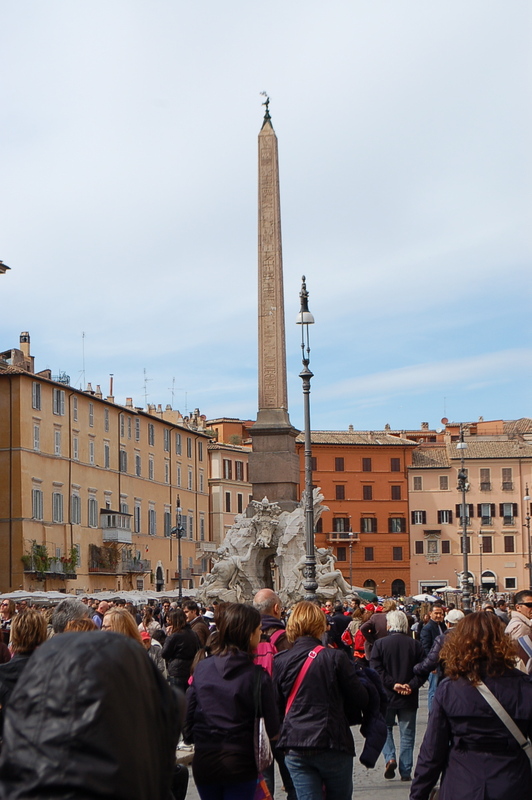 We did some more exploring after lunch and we both came to the conclusion that while Rome was exceedingly overrun with people this past Easter Monday (I’m aware we added to the madness), it was not really like being in Pandemonium, as appealing an image that was to me. It was more like being at a big party here on earth, where the order of the day was to have fun, not to create hellfire and damnation. Less romantic, but probably a good thing. 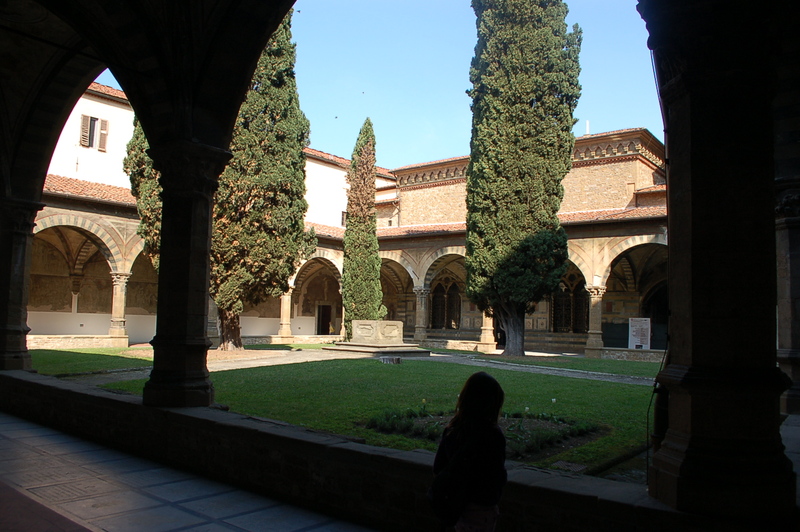 When I accepted Mario’s kind invitation to join him in Florence for the day, with a trip to the town of Fiesole, I did not expect that my most vivid memory would be of our lunch, (save for the breathtaking Spanish Chapel at the Museo Santa Maria Novella). 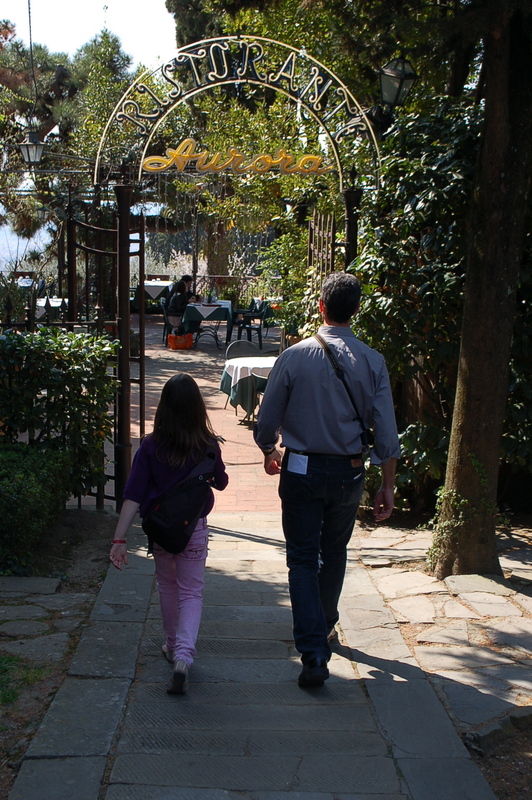 Myself and my daughter met Mario bright and early on Sunday morning, and arrived in Florence just after 10am. 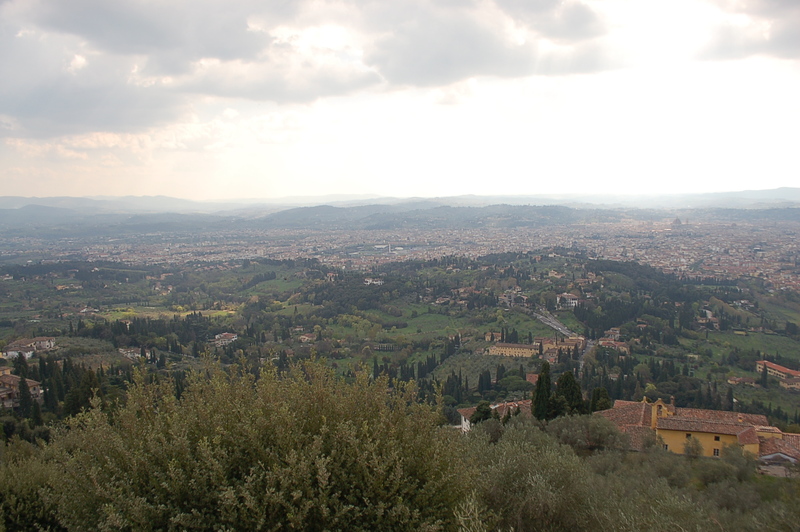 Our ultimate destination was Fiesole where Mario wanted to Walk Out a tour itinerary to be included in the book he is currently writing: Strolling Through Florence; the Definitive Walking Guide to the Renaissance City. He needed help with the task and I was the right girl for the job. That is a slight lie actually, as Mario is one of the most efficient and capable men that I know, and if anything, I was a distraction. Suffice is to say that I went along for the sheer fun of it. 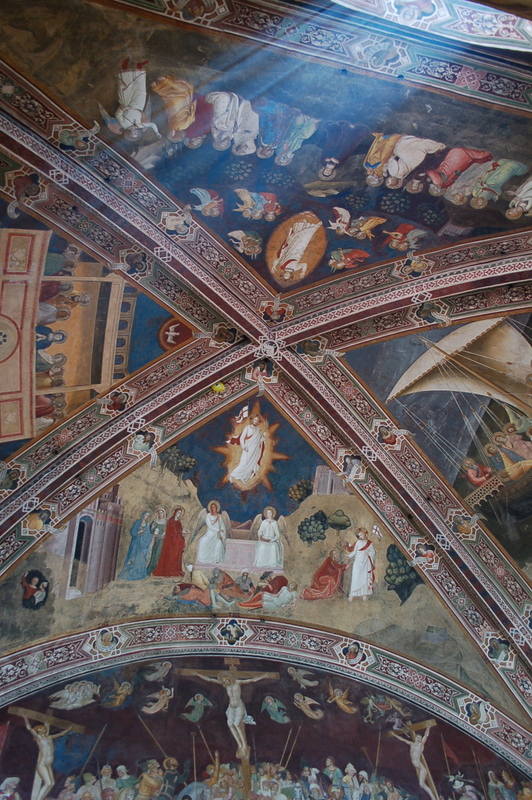 As we headed out with a plan for coffee, and were dashing past the Museo Santa Maria Novella, we both thought about my friend John, and how when he was here visiting, did not have an opportunity to see the Spanish Chapel, which he was downright glum about. We had to make an important detour for him. 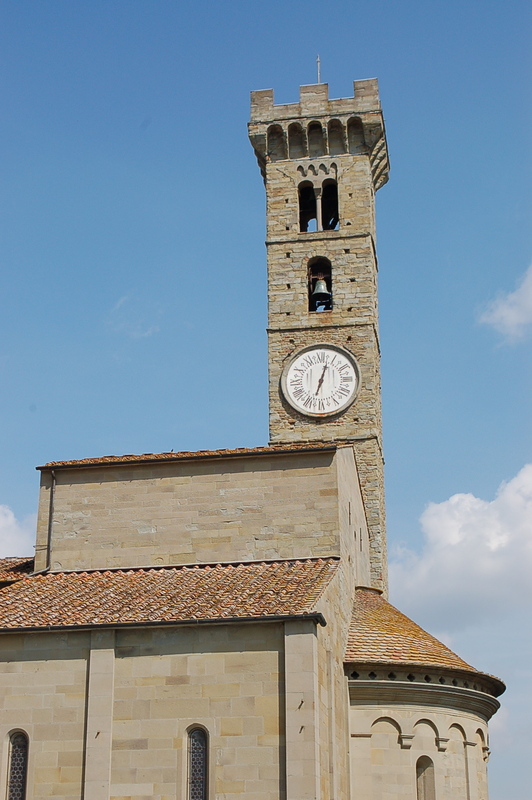 As we left the chapel we both said we could have jumped right back on the train for Cortona. 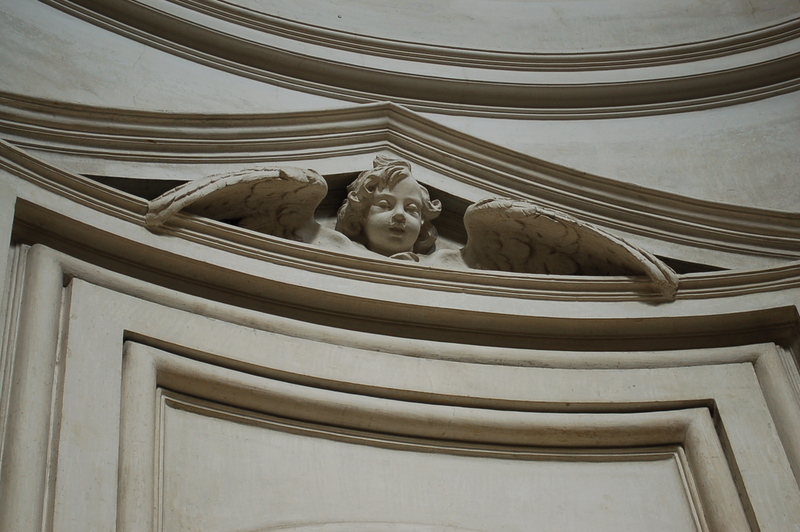 It was truly a feast for the eyes and I had a definite tinge of guilt that it was my eyes instead of my friend’s, marvelling at the message of Dominicans as guides to salvation. After another detour (I was desperate to buy a book! 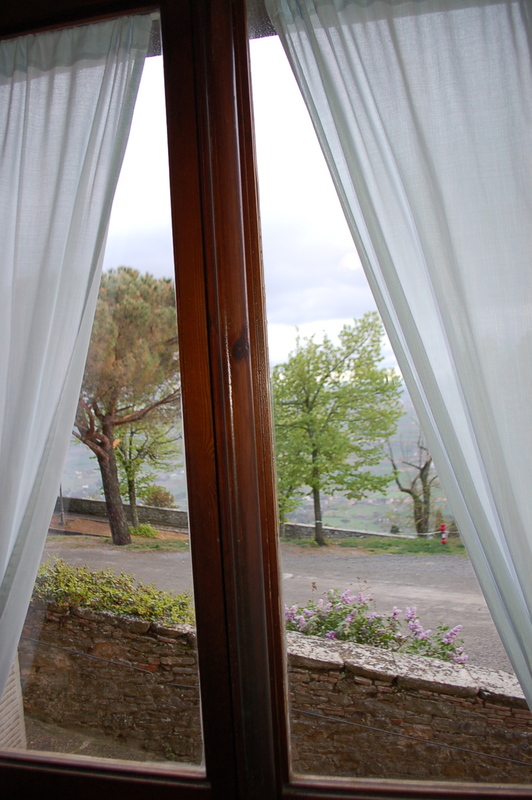 ), we hopped on the #7 bus to beautiful Fiesole. The bus lurched, and wound it’s way up and out of the city, and the fact that I was jammed far too intimately between complete strangers was forgotten as I watched Florence plummet downwards with every spin of the wheels. The first thing on Mario’s list was lunch (a man after my own heart), and we were lucky and happened upon a lovely place called Villa Aurora. 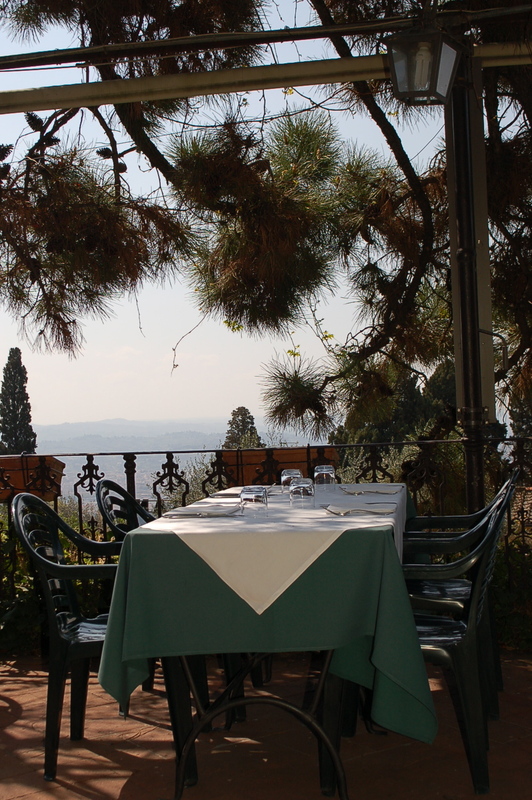 The garden of the restaurant teetered on the edge of the hillside and was quite over-canopied with Italian umbrella pine trees, whose branches gnarled around a metal overhang. Mario was feeling like the season had changed and it was time to get into summer mode. 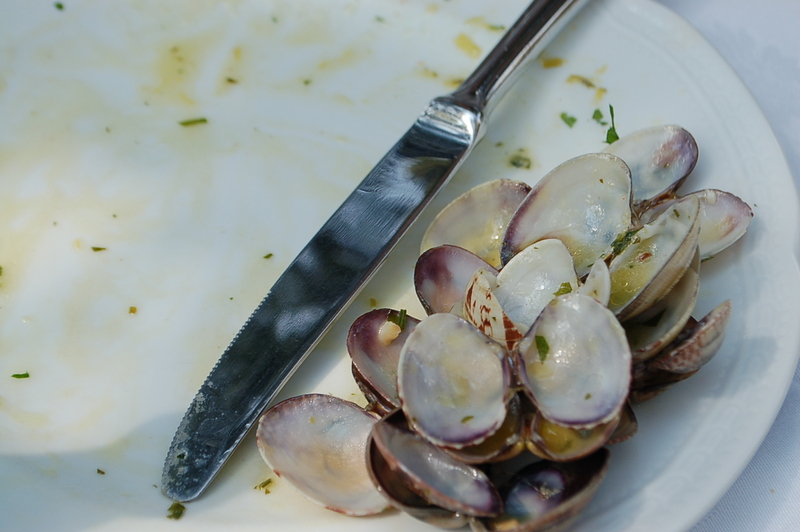 He was hell-bent on having seafood, and a nice bottle of white wine to go along with it. He is the same man who on March 20th doffed his coat, replaced it with a t-shirt and declared winter was most definitely over! There have been plenty of chilly days since this declaration but he has refused to cover his arms out of pride and obstinacy. Far be it for me to dissuade him, and tell him perhaps not to be disappointed if everyone was not feeling as “Summer-y” as he. Our most elegant of waiters, with crisp white shirt and stiff black apron led us to our table and handed Mario a menu. He instantly opened it and scanned it for anything sea-related. He lit up when he discovered that the restaurant had also changed seasons with him (or for him, as he liked to think). 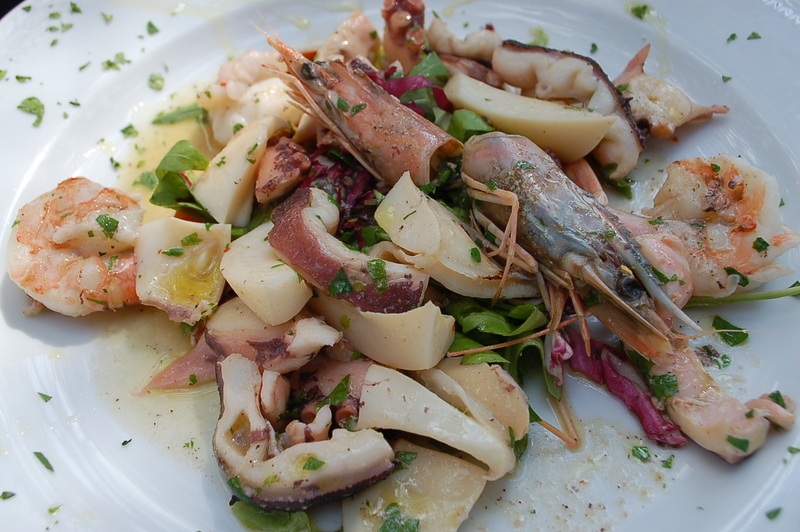 Polpo, Sepia e Gamberi (octopus, cuttlefish and shrimp) on a bed of wild greens with citrus and oil. We started our meal with a truly refreshing seafood platter which went amazingly with the perfect bottle of white wine Mario insisted on splurging on. It was a hot day and sitting in this garden overlooking beautiful Florence being waited on, was an indulgence of the highest order. 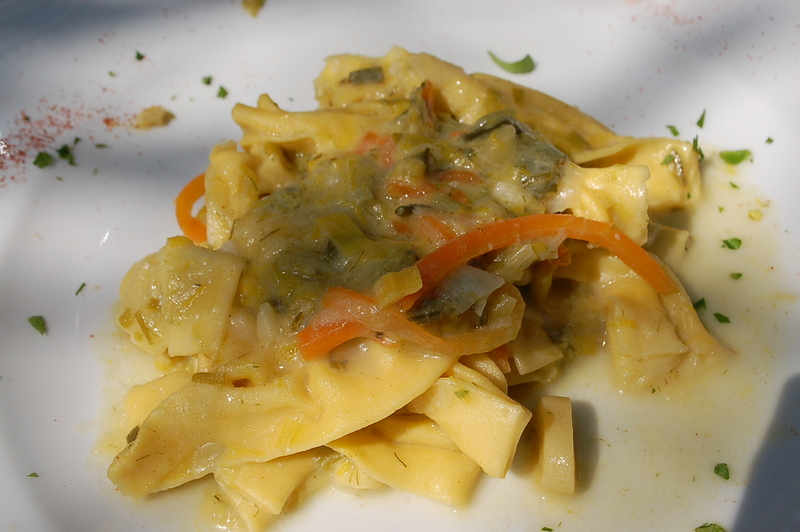 The food streamed to our table at a lazy summer pace, giving us time to sit and talk about how Fiesole became this little paradise perched above the metropolis. 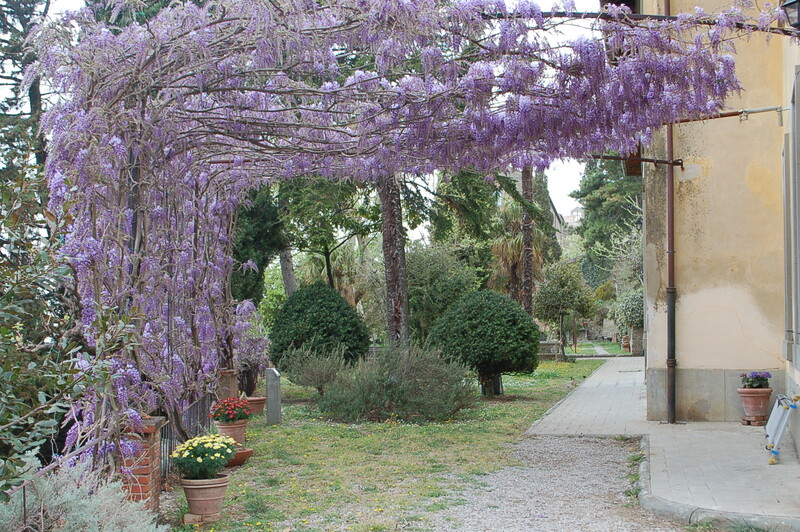 Fiesole is an Etruscan town, which was conquered by the romans around 280 BC. An interesting fact (to me) is that it was once the location of the most important School of Augurs (Omen diviners). 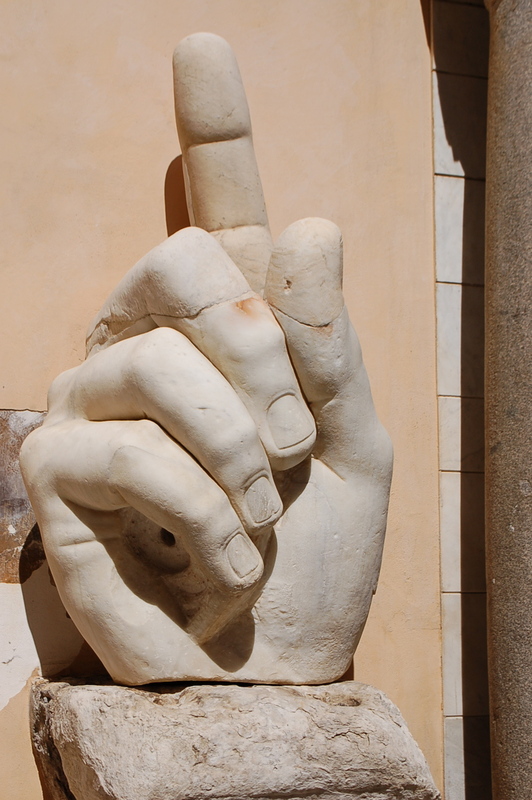 I could very easily imagine these roman divinity students seated on the ancient walls of the city studying the birds in the air, their flight pattern, and the noises they made as they soared. And, from their interpretations decide on matters ranging form religion to war for the government and private citizens. 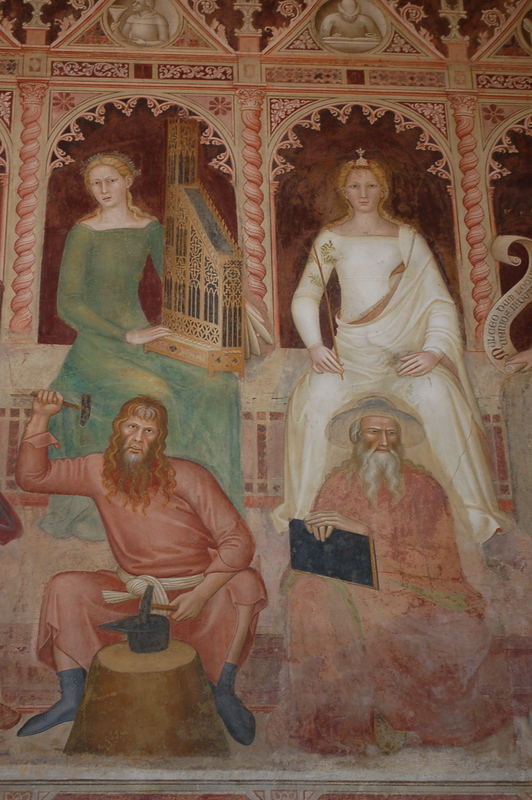 The town went through all sorts of wars, changes, and long periods of peace, before being conquered by Florence who eventually realized that Fiesole was the ideal spot to build a country villa. 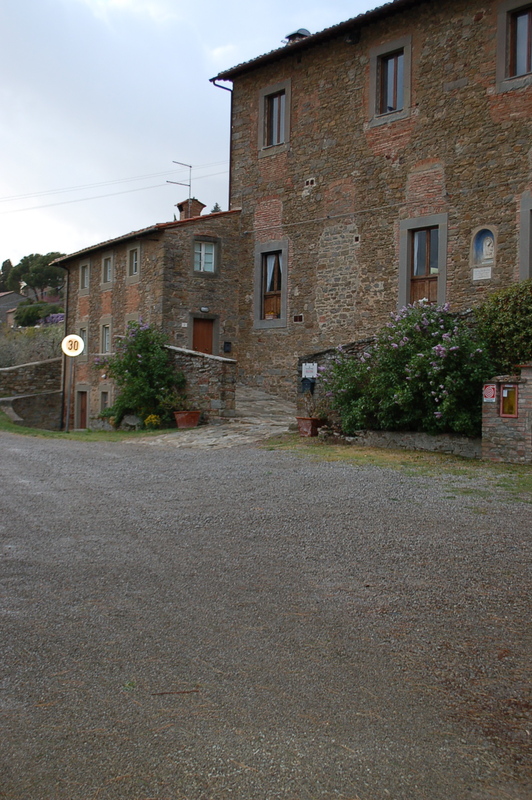 And so it became the playground of rich Florentine families who, in a matter of an hour could be out of the noisy city, and sitting in the quietude of quaint Fiesole. A very simple dessert is all that was needed to end this meal. As our lunch was winding down, this garden restaurant had filled up table by table with all sorts of escapees from the city, and other far-flung places. I was very content to sit idly watching the various couples, families, and friends all dining, and drinking-in the majestic view as we were. 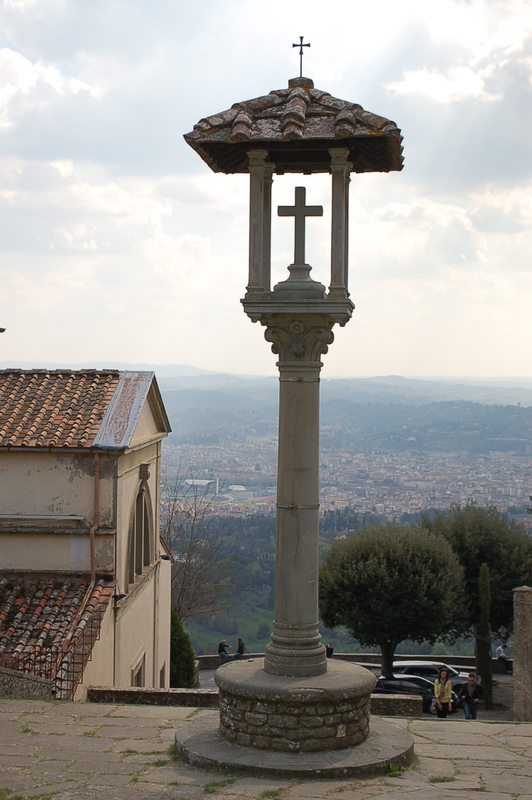 We were so lazy after we had our delicious meal, but decided that no matter how sluggish we felt, we had to make it to the Convento di Fiesole (monastery) at the peak of Fiesole. We slowly wound our way through a park and up the steps to the place were the 14th century monk San Bernardino da Siena had his cell. The view was vertigo inducing, as well as awesome. The train ride home was quiet, with three exhausted passengers too tired to talk, but very content indeed. 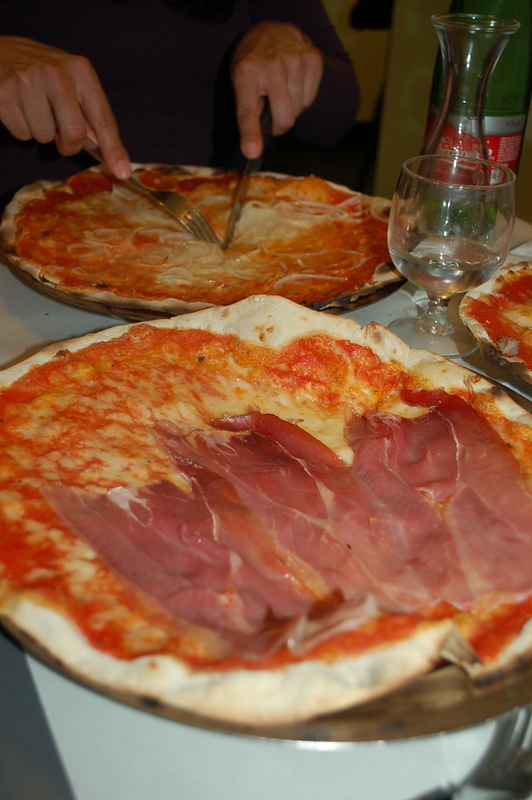 My trip to Rome with some friends and students combined education and fun, (overlapping frequently), and, one of the things I really looked forward to, was having lunch. It may seem a little pathetic to be in one of the most beautiful cities in the world, with art and history at every turn, and to be thinking about my stomach, and what deliciousness I could fill it with! It was hardly my fault as, on the train ride in from Cortona, and while touring as many Baroque churches as we could at lightening speed before they closed, Mario reminded me several times of the fabulous place he was going to secure us a table for our well-deserved repast. 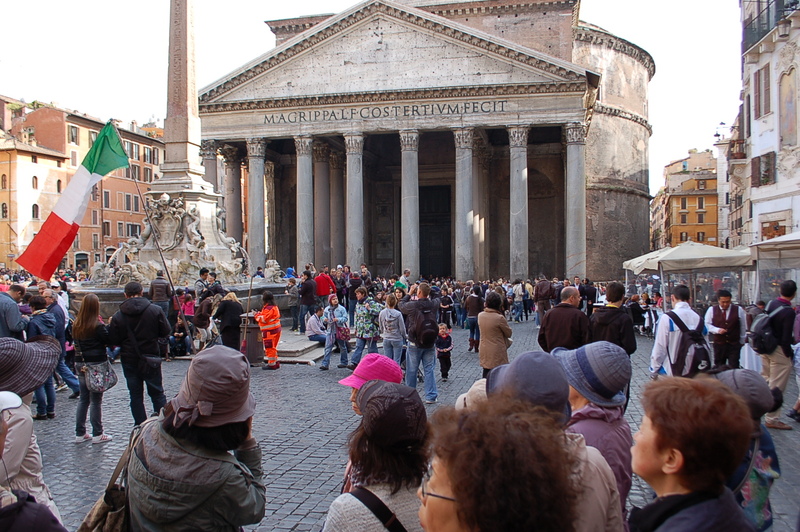 When the announcement to break for lunch was made, Mario bolted through the crowded thoroughfare (that is Rome!) to snag a table. I walked behind with Danielle (our lovely art history expert, and fast friend) smiling in amusement at him zigzagging his way out of sight. Mario’s gusto was for nought however, as no end of charm doled out by him was enough to get us a table for at least 45 minutes. That would have been fine except we only had 75 minutes before we had to be back on our whirlwind baroque tour. Plan B was put into action immediately. 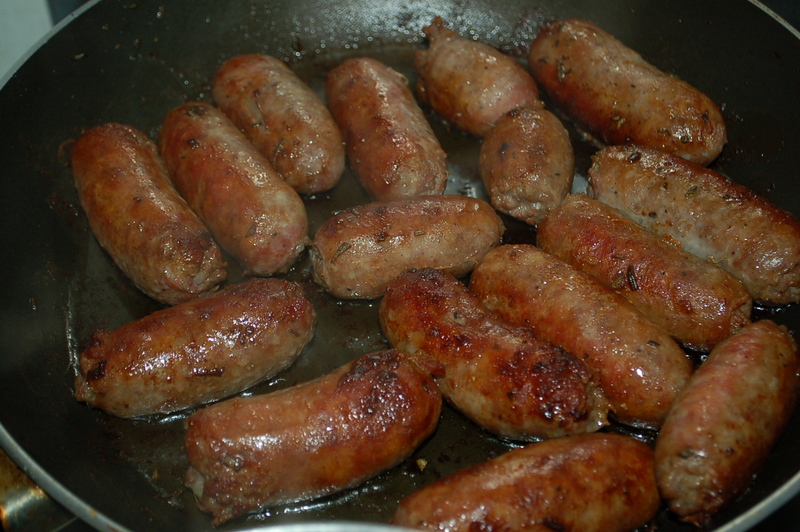 There was a quick gastronomic exchange between himself and Danielle, and off he went again! 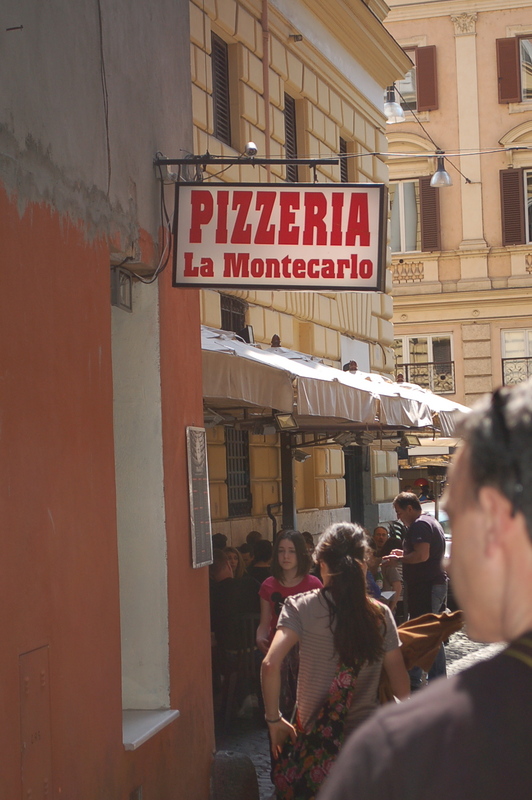 Our destination was Pizzeria La Montecarlo. It was a veritable madhouse, inside and out. There were people clammering for tables from every angle, and so it was a mystery to me as to how Mario was able to talk his way into getting our party of 5 a table almost instantly? 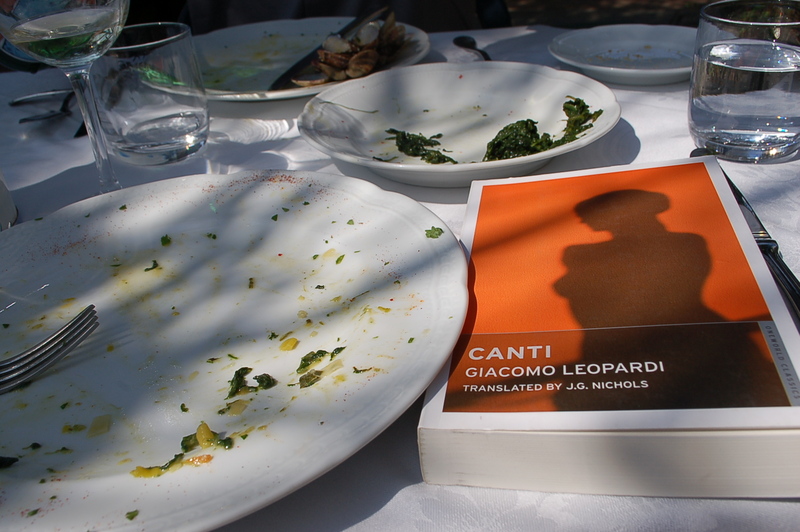 Possibly something to do with the fact that Rome is as familiar to him as his backyard, and the waiter recognised him! Being in company such as his, in a place like this, certainly had it’s advantages (making note that the next time I go to Rome, he will be by my side). 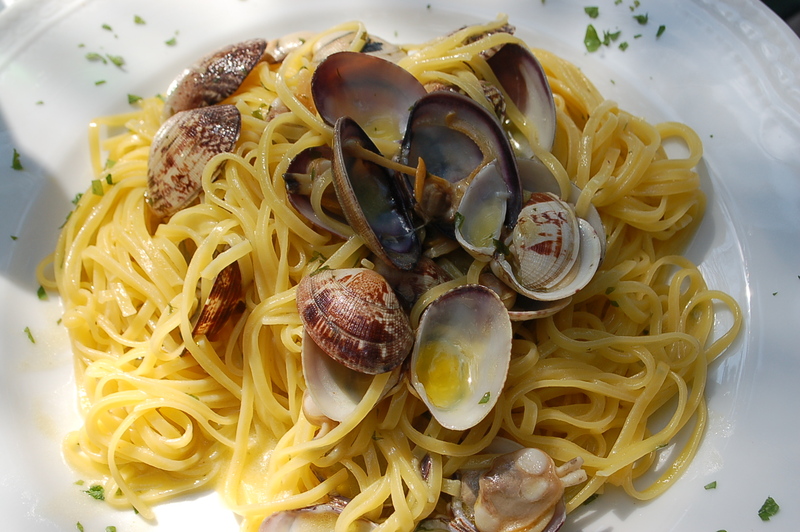 I was finally having the restaurant experience I had dreamed of before I arrived in Italy. It was crowded to the point of exploding, waiters were loud, laughing and joking with customers, and in the same instance balking orders at each other, and all of this din was music to my ears. 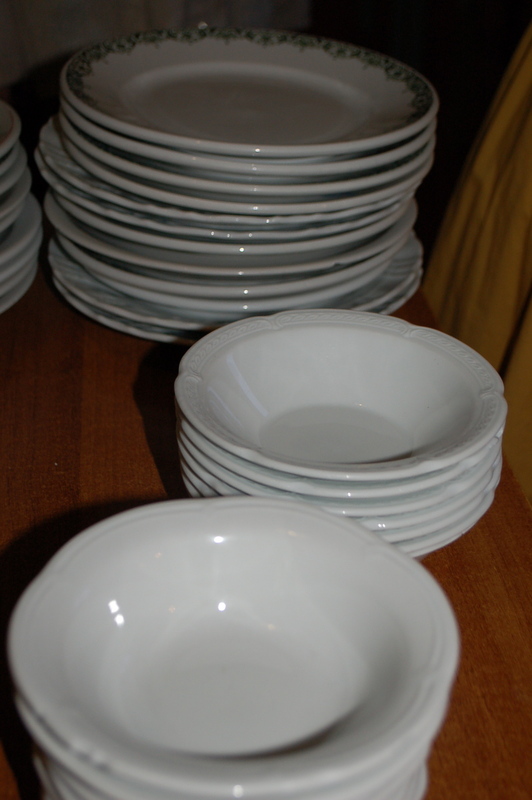 Getting to our table was a game of dodging and side stepping waiters carried enormous platters of pizza or glasses with carafes of vino della casa! 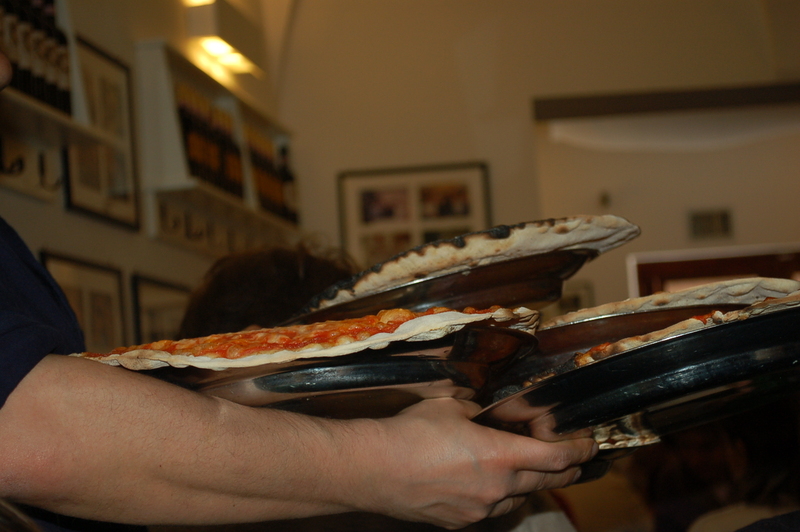 This waiter could carry any amount of pizza! We squeezed into our table and had menus in our hands, and wine on the table in a flash. 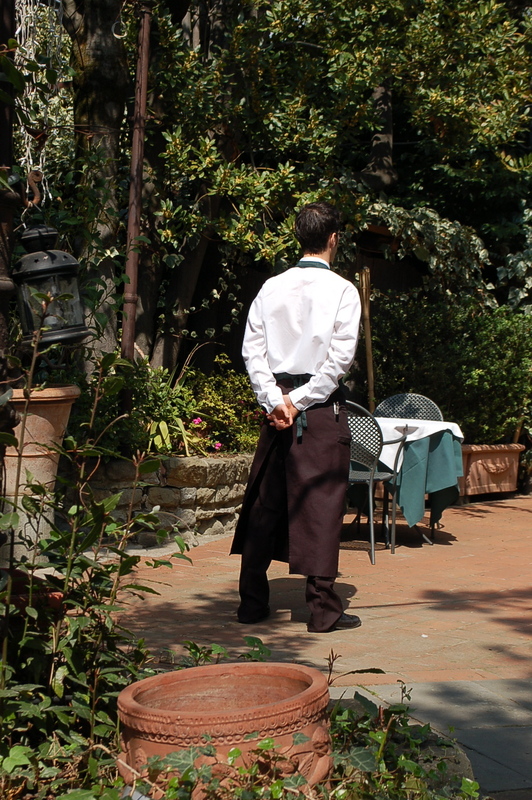 These waiters were like machines, but possessed that lovely Italian charm and relaxed easy demeanour of someone who had all the time in the world to stop and chat at their leisure. The energy in the room was intoxicating, and I was very happy to let it wash over me, and sweep me up in this celebration of people getting to sit down together and eat something splendid. 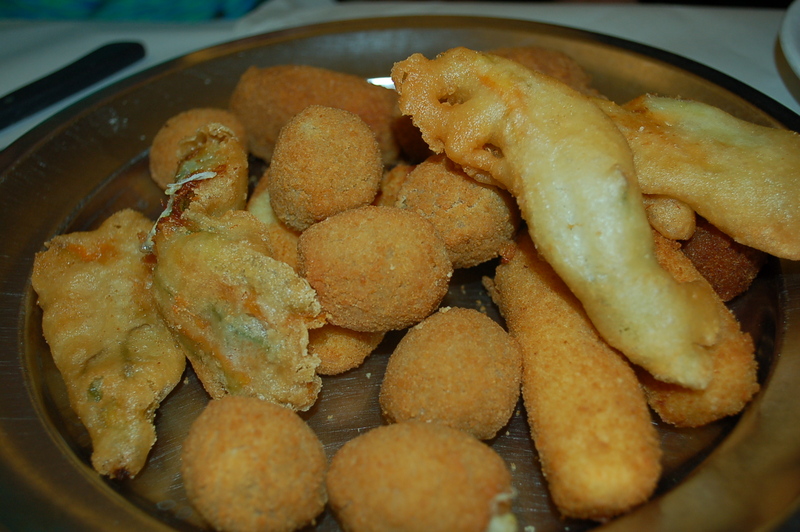 Danielle said we should try a platter of typical roman fried food to start, which we did, along with 5 pizzas. This was going to be a feast, and on looking around the room, everyone else appeared to have the same celebratory sense, with food teetering on the edges of tables. Mario had the Montecarlo pizza. The piece de resistance was the fried egg on top. 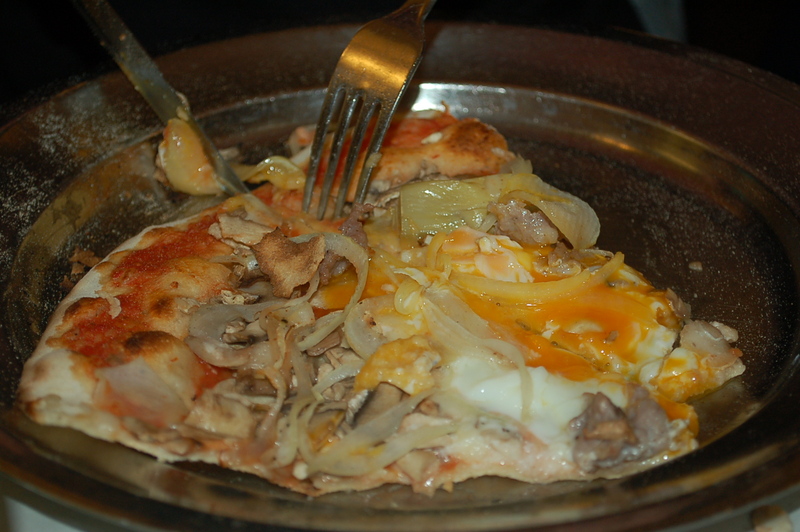 The trick was to eat the piece with the egg on it last, as by that time, it is cooked to unctuous perfection. The fried food was one of those things you could eat all day long (like when you open a bag of potato chips, and no matter how hard you try, you can’t stop eating until they are all gone!). We had fried mozzarella balls, covered in a cornmeal batter, along with rice balls, zucchini blossoms stuffed with cheese, and olives stuffed with anchovies. It was hard to leave room for my pizza, but I sat on my hands to stop me from completely filling up on these jewels of oily, battered goodness. 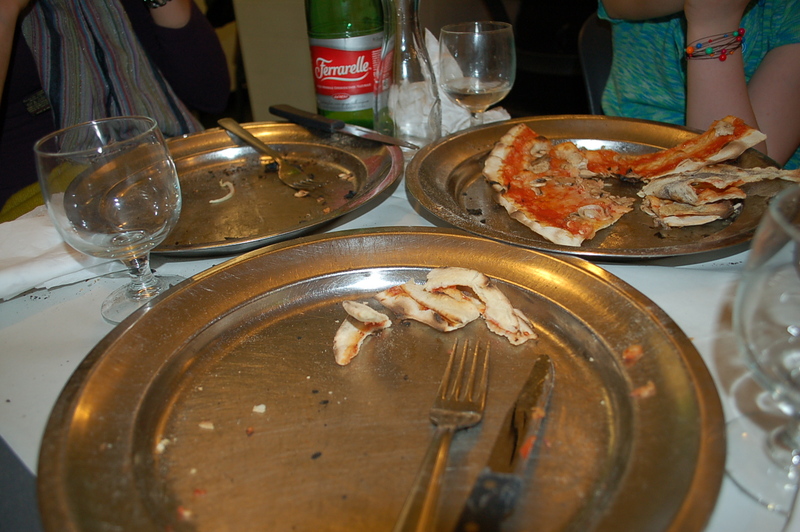 Our pizza arrived in a flurry and as we ate, I marvelled as waiters sailed by carrying tray upon tray of pizzas in Cirque de Soleil style! 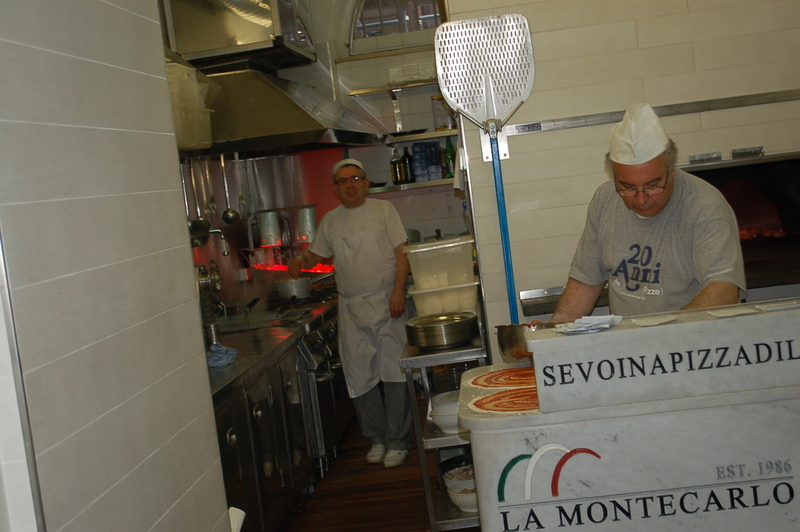 There was something so energizing about being in a place like pizzeria Montecarlo at the height of the lunch rush. 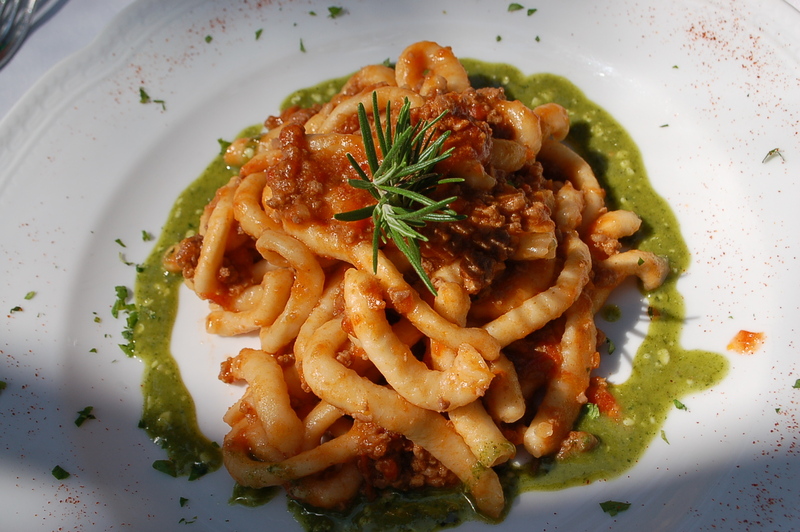 It made me eat my food in a more frantic way, like it was my last meal, and each bite precious and memorable. 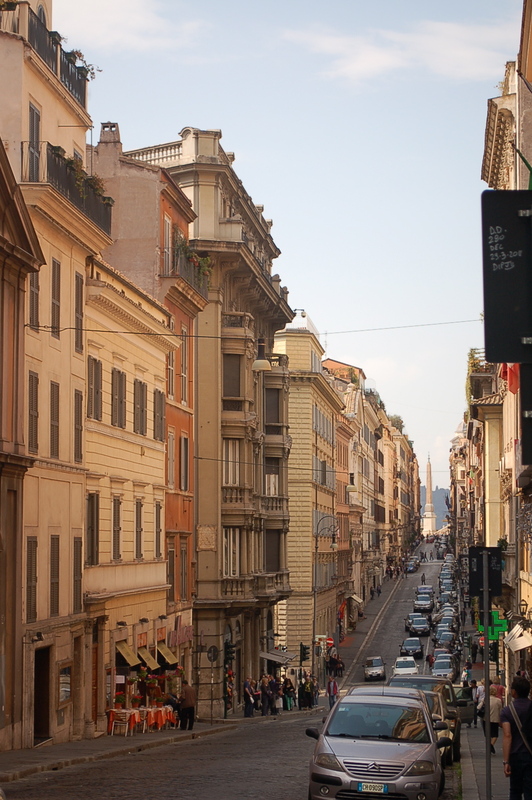 In the distance; Trinita dei Monti at the top of the Spanish Steps. We all got swept up in a wonderful food moment. 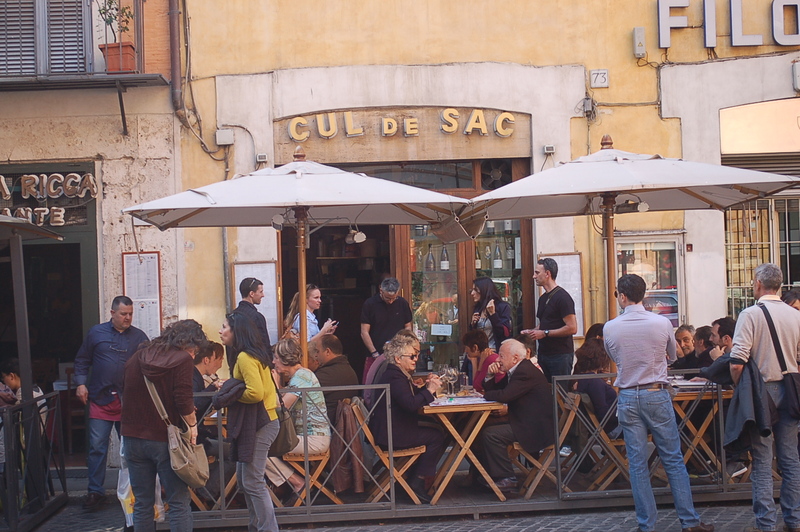 It was sunday in Rome and everyone was out and about savouring what they could of the beautiful day, and I glad to be among them.